Its November, Bonfire night is in just a few days and Christmas is next month. In just four weeks I will be putting up my Christmas decorations, so I guess I should take down the Halloween ones! I think that I had better start getting serious with what I am doing and it it is a good week for me to do this as this week is the Family Room Week in the Holiday Grand Plan. We don't have a Family Room as such, but we do have family areas and I need to move one of them around so we can put up the tree. I have already done the deep clean in the living room, and I have sorted out all the Children's toys but I haven't gone through the colouring books and pens or crayons. I also have a lot of videos and DVDs that need clearing out and categorising and then there is still a lot of things that need finishing off! So this week won't be too hard, but I won't be slacking off either! 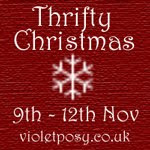 This week I am going to go in a little bit of Christmas over drive, and will post my ideas for having a frugal Christmas as part of the Thrifty Christmas Celebration over at Violet Posy. It seems that I am now in fashion with my thrifty ideas and ways!